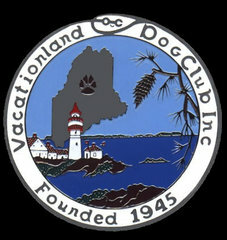 The Vacationland Dog Club was founded in 1945 to serve the canine community in and around Cumberland County, Maine. We are a non-profit organization dedicated to the advancement of purebred dogs. As a group, we are current and retired breeders, pet owners, and all-around dog lovers. Some of us are currently showing our dogs in conformation, obedience, rally, agility, or tracking, or participating in other dog-related activities such as pet therapy. Some of us simply enjoy participating in and working at Club activities. We all share a love of dogs and are interested in furthering the sport of purebred dogs through our Club. VDC holds two AKC all-breed point shows and obedience trials each year in May as part of the Southern Maine Coastal Classic cluster, held in conjunction with the York County Kennel Club of Maine. We established a scholarship fund, to be given to a qualified St. Joseph's College student who will be pursuing a degree in veterinary medicine. A separate annual award is also given to a deserving senior student who is preparing as a veterinary technician through the University College at Bangor program. The St. Joseph's fund was established approximately 20 years ago; we initiated the Bangor contribution in 2005. All our activities require much planning, time, and work. We heartily welcome new members who share our interests and are willing to work with us to achieve our goals. For more information about club membership, meeting dates, and contact information, see our Membership page. Our Club is dedicated to public education and responsible dog ownership. In conjunction with three other Maine dog clubs, we take part in an annual Meet the Breeds event, in which we invite the public to meet our dogs and ask questions about the various breeds. We are also a member club of the Federation of Maine Dog Clubs, Inc. The purpose of this club is to encourage and promote the raising, general care and training of purebred dogs; to promote harmony, fair play and good sportsmanship in the best interests of purebred dogs; to encourage the novice owner and breeder in his approach to the raising, general care and training of purebred dogs; to assist all members in the showing, breeding and general care and training of their dogs; to assist the general public to understand dogs of all origins and to learn to better care for and enjoy them through educational and instructional programs, projects and exhibitions, obedience and field trials, all under the rules and regulations of the American Kennel Club. VDC now has a Yahoo group for club members, called VDC-club. To join, go to http://pets.groups.yahoo.com/group/VDC-club and click the Join This Group button, or send email to VDC-club-owner@yahoogroups.com.